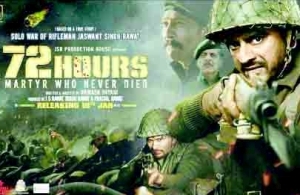 Following the biography of Jaswant Singh Rawat, this movie is set in the 1960s, when apart from economic instability, famine and religious fights, India was struggling with the Sino-Indian War. Jaswant was born in a poor family of Garhwal, Dehradun. He grew up to be a responsible son, devoting his life towards study and his family, but due to several incidents, he decided to join the army at a young age and received his training at Garhwal in Pauri Garhwal District and became a soldier of Garhwal Rifles Regiment. Shortly after his training, their paltan is sent to defend the approaching Chinese army from the North-East front on India. Due to adverse circumstances, the infantry has to step back. However, Rifleman Jaswant Singh Rawat refuses to leave and fights against the Chinese army alone for 72 hours.